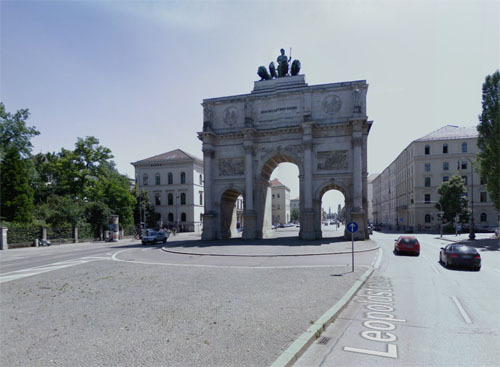 The Siegestor (English: Victory Gate) in Munich, is a three-arched triumphal arch crowned with a statue of Bavaria with a lion-quadriga. 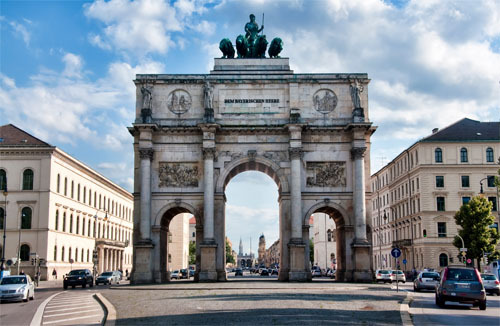 The Siegestor is 21 meters high, 24 m wide, and 12 m deep. 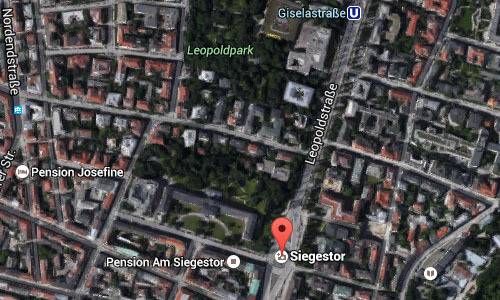 It is located between the Ludwig Maximilian University and the Ohmstraße, where the Ludwigstraße (south) ends and the Leopoldstraße (north) begins. 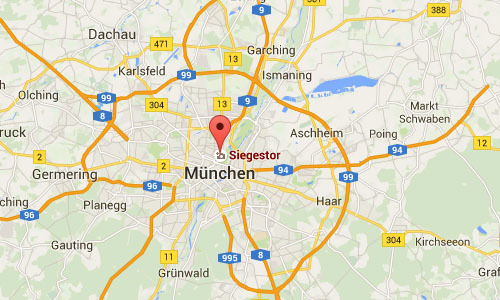 It thus sits at the boundary between the two Munich districts of Maxvorstadt and Schwabing. The gate was commissioned by King Ludwig I of Bavaria, designed by Friedrich von Gärtner and completed by Eduard Mezger in 1852. The marble quadriga was sculpted by Johann Martin von Wagner, artistic advisor to Ludwig and a professor at the University of Würzburg. Lions were likely used in the quadriga, instead of the more usual horses, because the lion was a heraldic charge of the House of Wittelsbach, the ruling family of the Bavarian monarchy. The gate was originally dedicated to the glory of the Bavarian army (dem bayerischen Heere zum Ruhme). 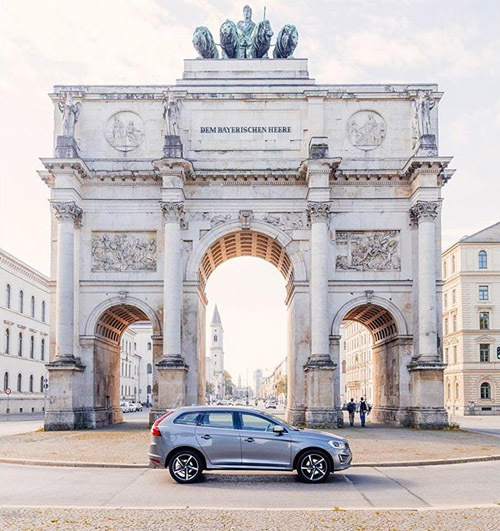 Today, the Siegestor is a monument and reminder to peace. After sustaining heavy damage in World War II it was to be demolished in July 1945, however, the gate was reconstructed and restored only partially, in a manner similar to the conservation of the Kaiser-Wilhelm-Gedächtniskirche in Berlin. The new inscription on the back side by Wilhelm Hausenstein reads Dem Sieg geweiht, vom Krieg zerstört, zum Frieden mahnend, “Dedicated to victory, destroyed by war, urging peace”. In the early 21st century, the remaining statues were meticulously cleaned and restored.